We’d love your help. 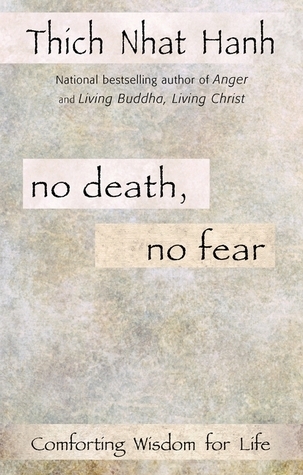 Let us know what’s wrong with this preview of No Death, No Fear by Thich Nhat Hanh. To ask other readers questions about No Death, No Fear, please sign up. Well, it has happened. I have reached the point in my life where death lurks closer and reaches out more frequently. This is not a happy topic; not many of us are calm in the face of it. But I am nearing 50 as my parents approach 80. "Guess who died?" has become a conversational staple with a huge cast of players. I think back to the neighbors I grew up with...and most of the adults of my childhood are gone. I have lost friends and classmates and colleagues. And then there are the celebrity deat Well, it has happened. I have reached the point in my life where death lurks closer and reaches out more frequently. This is not a happy topic; not many of us are calm in the face of it. But I am nearing 50 as my parents approach 80. "Guess who died?" has become a conversational staple with a huge cast of players. I think back to the neighbors I grew up with...and most of the adults of my childhood are gone. I have lost friends and classmates and colleagues. And then there are the celebrity deaths; every week or two I read of another death somewhere out in Malibu or in the Canyon and another familiar name from the old movies or the sitcoms of yore gets checked off the death pool. Lately it has come to a bit of a crisis. I understand that this crisis is a common one and it is called Middle Age. In an effort to refrain from morbidity and not turn into one of those embarrassing people who try to outwit the march of time with age inappropriate clothing, plastic surgery and muscle cars (not that I could afford that approach) -- I opt to turn to Zen teachings in my recent hours of crisis. Thich Nhat Hanh, gentle yet strong, wise yet humble, provides a calm voice to Buddhists and non Buddhists alike. I selected No Death, No Fear because my goal is to temper my fears about losing my loved ones and, eventually, my fears about my own demise. I imagine achieving this goal will entail constant practice and that the erosion of the fear will occur a little at a time. Thich Nhat Hanh reminds us of the concept of impermanence. It is helpful for me to bear in mind that absolutely nothing material in my life will last forever and none of us will live forever. No Death, No Fear asks us to live as much as possible in the present and to remember that parts of us 'die' everyday. Cells in our body die and are replaced by new ones. Our physical appearance is tempered with the years. Our moods shift. I no longer look like the child I was. But my memories assure me that she is part of me to this day...albeit in a different form. Contemplating impermanence helps us to hold on less tightly to many things in our lives and keeps us more firmly rooted in enjoying the here and now. The second exhortation which I found to be both powerful and challenging is the practice of smiling at death. Thich Nhat Hanh encourages us to focus each day for a moment on the knowledge that we must die. And to smile. This is the most profound acceptance. If I say to myself each day: "Someday I will die." How much more will I treasure the small pleasures that I have? How much more closely will I hold those who are dear to me? How much jealously and anger and sadness will I be able to dispose of because I know that I do not want to spend my temporary time here engaged in those foul days? Days when I am bearing grudges and comparing my life with others only to come up short in my own mind? Our American culture does not encourage us to 'not be our bodies'. Thin and toned and attractive people are seen as society's winners. We also construct our entire society around material success. You either live in a 'nice community' or you don't. (Money) You either get a good education, or you don't. (Money) You either see a highly regarded specialist for your medical condition or you don't. (Money) This structure encourages us to clamour after material gain (read security). And we often become transfixed by 'stuff' at the expense of our relationships, our time and our mental and emotional well being. We fear old age here and for good reason. Our culture belongs to the young. Our elderly are sidelined and warehoused. Out of sight, out of mind. Can you blame any of us for being reluctant to embrace a stage in life where we are likely to be poor, lonely and forgotten? That is why we must learn to smile at this stage and welcome it as best we can. We must learn to continue to live each day in the moment as much as possible, being appreciative of the smallest comfort and pleasure. We must recall those we loved and lost often and joyfully...and tell stories of their lives to others in order to keep their memory and spirit alive. We must strive to treat others with compassion and fairness and to provide joy and help as much as possible to those around us. Leave them good memories of us to share and reflect upon after we are gone. If we focus each day on these things and constantly go about the business of leading our lives in the moment...we will live happier lives and die more peacefully. I use the charming stories in this book for my own classes. Of all the books on my bookshelf about Buddhism and emptiness, this is the one I turn to when I need to come back home. Simply told, clearly described, and gently narrated, the charming stories that enhance the main body of the book convey the beauty of this changing universe that we are all a part of. By "looking deeply," we see the miracle that is right before us. We see that although it is ever-changing and forever unfolding into som I use the charming stories in this book for my own classes. Of all the books on my bookshelf about Buddhism and emptiness, this is the one I turn to when I need to come back home. Simply told, clearly described, and gently narrated, the charming stories that enhance the main body of the book convey the beauty of this changing universe that we are all a part of. By "looking deeply," we see the miracle that is right before us. We see that although it is ever-changing and forever unfolding into something new and wonderful, it is simultaneously forever a part of us. In one story a woeful river falls hopelessly in love with a cloud, only to realize one night that he is also the cloud in a different form. A most profound and comforting insight, for, if I can see...really see, that like the river, I too, AM the cloud, as well as the trees and the oceans, and everything else, then I can also see that death is not some horrifying act of annihilation! It is not something that takes me away, that separates me from all that is familiar. Death is found in change itself--every moment is birth and death...birth and death. Or, flipped over, there is no birth and no death; just transformation! I've never read a "self-help" spiritual book before. I read several books on how to cope with coming out back in the day, but this was the first non-Christian text to cross my path. I am kinda speechless. The thoughts and actions that are presented in No Death, No Fear are universal. Hanh is a famous Buddhist monk, known for providing training in mindfulness and spirituality. I am not gonna comment heavily on the writing. I don't feel as if nitpicking on a book that covers this subject matter doe I've never read a "self-help" spiritual book before. I read several books on how to cope with coming out back in the day, but this was the first non-Christian text to cross my path. I am kinda speechless. I am not gonna comment heavily on the writing. I don't feel as if nitpicking on a book that covers this subject matter does me any good. That should not be the focus (or it isn't for me anyway). This book was amazing. Although I am familiar with Thich Nhat Hanh's work, I have never read a complete piece of his. Given to me about 10 years ago after my father passed away suddenly, I am only completing it now. Funny how books come into your life, or you are able to sit down with them, at precisely the right moment. Wow. It had a very natural flow to it and in the last chapter brings it full circle beautifully. There is no death, and therefore no fear. I am a practicing meditator and read qui This book was amazing. Although I am familiar with Thich Nhat Hanh's work, I have never read a complete piece of his. The book is filled with buddhist philosophy and it "drowns" you with reflections on life and death, while showcasing the practice of breathing. All in all, I cannot imagine a better way to define death other than continuation. And I cannot see a better way of approaching life. "birisine çok kızdığınızda ve o kişinin ortadan yok olmasını istediğinizde lütfen geçiciliğin gözlerinden derinlemesine bakın.eğer o kişi yok olsaydı, ne hissederdiniz?" ilk defa spiritüel-kişisel gelişim tarzında bir kitap okudum. sürekli aynı şeyleri tekrarladığından, atlaya zıplaya çabucak bitirdim.yine de bana kattığı çok şey oldu.özellikle ölüm korkusuna farklı bir pencereden bakabilmemi sağladı. My grandmother was recently diagnosed with cancer. Learning of her illness brought up many feelings of worry, fear & anxiety concerning death & impermanence. I would recommend this book to anyone struggling with those same fears, or to anyone who is suffering the loss of a loved one. The insight is calming & deep. Very good book, but I was expecting something different. I gave 3 starts because it was expectation mismatch. It's fairly repetitive - in a way, it's effective, because it allows you time for the ideas to sink in and not just be words, and they certainly sound like just words, like just playing with language. That's part of the message, true, although it's hard not to be put off by it. He completely neglects defining anything, which I guess suits the philosophy, but to say that because a cloud becomes rain therefore the cloud IS the rain or because a paper cannot be without the fo I'm not sure I buy it. It's fairly repetitive - in a way, it's effective, because it allows you time for the ideas to sink in and not just be words, and they certainly sound like just words, like just playing with language. That's part of the message, true, although it's hard not to be put off by it. He completely neglects defining anything, which I guess suits the philosophy, but to say that because a cloud becomes rain therefore the cloud IS the rain or because a paper cannot be without the forest therefore the paper IS the forest, that you are just a continuation of your ancestors and the environmental circumstances that formed you therefore you continue to exist in a different manifestation in your descendants and environment - well that's just completely ignoring the question of what YOU are, and sure you can come up with a definition that fits this philosophy but that seems a little circular. if someone dies, some very key patterns of behavior are no longer manifested even if their atoms are manifested in the worms and dirt and trees and air, and other patterns are manifested in their children and friends, still there is something important that is totally gone. but sure, just define whatever's still around as the same person or thing manifested and then you're set. "That is the advantage of being a meditator; you do not have to travel. You just sit there and look deeply, and you can see and recognize everything." Except that you can only recognize it having already been equipped with a brain capable of seeing and recognizing things; and although a great deal of 'everything' can be, in principle, observed from the flower or paper you see in front of you, given sufficient 'insight', I feel like there are some things that can't really be deduced from focusing merely on the human-scale, or merely by looking at one particular thing. You'd have to observe many different elements, obscure weird things like mercury and uranium that have strange behaviors that allow you to learn about chemistry to a greater extent, and all the physical laws that apply at near-light speeds or in other circumstances or at other scales unfamiliar to humans, I mean ,I guess if all physics make some kind of inherent sense then perhaps you COULD deduce it all just from being at one scale, but historically at least we've had a much better track record with experimental over armchair science. I’ve always found great solace in reading books like this, books that provide a paradigm shift without being stuffy or overly preaching in nature. A New Earth by Eckhart Tolle was by far one of my favorites. I just find them hard to review for whatever reason. Perhaps because there is no ‘storyline’ or characters to discuss, and perhaps because the style of writing is so different from fiction writers. Either way, I hope I do this book the justice it deserves. The best part about the concepts dis I’ve always found great solace in reading books like this, books that provide a paradigm shift without being stuffy or overly preaching in nature. A New Earth by Eckhart Tolle was by far one of my favorites. I just find them hard to review for whatever reason. Perhaps because there is no ‘storyline’ or characters to discuss, and perhaps because the style of writing is so different from fiction writers. Either way, I hope I do this book the justice it deserves. The best part about the concepts discussed in this book is how easy they are to understand, and how quickly my mind latched on to them, as if I had always known these principles to be true, but had never accepted that knowledge. The discussions focus on the Eightfold Path of Buddhist teachings, though from what I read, these teachings would fit in with just about every major religion. To summarize, life is impermanent. Birth is not our beginning, death is not our end. For our birth to have been made possible, our parents must have existed. If they didn’t, then we wouldn’t be. So our existence began before our manifestation. And it began before our parents manifestation, too. For them to have existed, their parents must have existed, and so on back to the beginning of all existence. We are not made, or created, or born, but manifested at the time we were simply because the conditions were right for our manifestation. We are part of the process of creation, not a result of being created. the same holds true at the other end. We cannot die. Physically our bodies will break down and end, but the impact of our being spreads outward in all directions. Had we not been, the world would be a different place. Our existence doesn’t just touch the world, it changes the world, and since those changes do not end when our bodies end, we cannot cease from being. Each encounter we have, and each action we take makes us permanent, even though we have manifested into impermanent bodies. I absolutely love thinking this way. The only part of the book that didn’t resonate with me was the number of times Thich Nhat Hanh repeated the same concept again and again. There is a lot of references to the impermanence of clouds, for example. I found myself thinking, “Okay, I get it. Move on.” I even considered setting the book aside and not completing it, though the last few chapters we so good I’m glad I did keep reading. Easy to understand, somewhat repetitive lessons on Buddhist ideas of impermanence and wholeness. I say "easy to understand," in that the examples make a lot of sense when I'm listening to them, but they're hard to wrap the head around in the long-term, and I'd have a hard time explaining the concepts to others without having to use the very examples given in this book. Fear, in its essence, is future-oriented. We fear something terrible is going to happen, we fear we are going to lose something or someone, and we fear that when bad things happen, we won’t be able to resist and bear. There are two inherent characteristics of our fears—uncertainty and negativity, none of which is inevitable about future. Future is never purely uncertain. It is uncertain if we will gain success or fame, even happiness and peace are not predictable. However, it is totally cer Fear, in its essence, is future-oriented. We fear something terrible is going to happen, we fear we are going to lose something or someone, and we fear that when bad things happen, we won’t be able to resist and bear. There are two inherent characteristics of our fears—uncertainty and negativity, none of which is inevitable about future. Future is never purely uncertain. It is uncertain if we will gain success or fame, even happiness and peace are not predictable. However, it is totally certain that death, aging, and disease will visit us one day. Likewise, suffering is certain, so is risk. However, we never tend to consider the certain parts of future. Instead of accepting our destiny and regarding them as a matter of fact, we choose ignorance and self-deception—as if suffering could be eliminated. Future is never totally negative. Future can be negative and discouraging, even when your current circumstances are excellent, bad things may still happen. All beings are subject to such a vicissitude of life and however rich or wealthy you are, no one can be an exception to this ruthless rule. However, future can also be positive—when you have a good grasp of opportunities, fortune can be made overnight. Life is a gamble. There is no promise on reward, but it could make one bankrupted and the other a millionaire. All fears, however uncertain and negative they might be, are originated from one original fear—the fear of death and solitude. Although it might not appear obvious, ask yourself this question: what is the worst that could happen to you? Yes, the loss of power, fame, money, and love is catastrophic, but not as bad as death and loneliness. Eventually, power, fame, money, and love are all external materials, they are bound to be transferrable and therefore volatile. However, when you lost life, that is the end of the game. So what does Zen Buddhism offer to overcome our fears? The answer is simple: there is no need to conquer our fears in the first place. Fear is a product of our own mind, not a representation of the reality. Fear is how we see the world, rather than what is really there. There is no death and no birth, why do we fear then? By birth, we mean an individual is born into this world. That individual was “nothing”, but became “something” after birth. By death, we mean an individual disappears from the world. That individual was once “something”, but now became “nothing” after death. However, if we look deeply enough, nothing is “born” into existence and nothing ceases to be existent. Before birth, a sperm and an egg were made from nutrients, once fertilized, the embryo received oxygen and nutrients from the mother and gradually grew into a baby. No thing was created during the process, but energy and substance were transferred, reformatted, and eventually manifested as a new-born baby. Similarly, when that individual died, the body was disintegrated and either transformed into heat if incinerated or fed insects and plants if buried. Again, no substance or energy was lost in the process, but the body was simply transformed into something else. If you look even more deeply, you will realize that we are always a part of universe, the constant transformation of energy, and we are never the substance but only the form. We adopted the form of a human being, just like the ant adopting the form of an ant or the lotus adopting the form of a lotus. We are changing constantly, but never cease to be existent. This can also be applied to power, fame, and wealth, whatever you wish. To me, here lies the beauty of mindfulness and Zen Buddhism—it is to put things in perspective and see things as they really are. Many consider meditation as a practice to improve our attentional control and to be in the “here and now”. Both are important, but to me, they serve a higher purpose—to achieve the insight that life is transitory and self is artificial. Yes, meditation improves our concentration, awareness, and acceptance. But without this insight of no death no birth, meditation only remains a form or an exercise. Since losing my son, this has been the most-healing, most-approachable book I’ve come across in months. I highly recommend it for anybody grieving, or who knows somebody grieving, or will someday grieve for loved ones - in other words, this book is for everybody, and that means you. It’s a quick, nourishing read. I had been wishing to read one of Thich Nhat Hanh's books for about 2 years but that can be said for many, many books and there isn't always an obvious reason for why some title rises to the top of that stack. But in this case there is a fairly obvious reason: the recent death of my mother after a short but punishing struggle to stay in front of her cancer. This is the not the first book on death and/or grieving that I've explored in the past year; it is just the latest addition to that shelf. S I had been wishing to read one of Thich Nhat Hanh's books for about 2 years but that can be said for many, many books and there isn't always an obvious reason for why some title rises to the top of that stack. But in this case there is a fairly obvious reason: the recent death of my mother after a short but punishing struggle to stay in front of her cancer. This is the not the first book on death and/or grieving that I've explored in the past year; it is just the latest addition to that shelf. So there you have the answer to "Why did I choose to read this?" I started the book on what would have been her 61st birthday. The book focuses a great deal on our innate fear of death and how to achieve peace with the knowledge that we must die. This was interesting, but, I don't fear death. That is, I have the natural aversion to death that comes with being alive, but I don't have an acquired psychological fear of death that needs to be tamed. The book also focused on how to accept the death of a loved one as part of a greater process of "manifestation" that is explained in the book. Again, I think my grief is of a "normal" variety and I don't seem to need coping mechanisms to help me accept my loss. I accept it. I don't like it but I certainly accept it. So, why do I keep reading these books? It feels like the right time to explore the shared human condition of death and loss. While the feelings and memories are still very raw for me I want to know how other people experience this event and how they communicate their experience to others. Which things are (nearly) universal and what things vary wildly from person to person? The only problem with my research is that I'm really restricted to people who write their emotions down and get them published which is probably a fairly specific subset even though it is populated by seemingly very different people. Hanh presents his approach as the necessary conclusion of years of Buddhist practice. That version of existence is fluid and perpetual; dynamic and eternal. It is not about being or non-being. I don't share the belief that something cannot possibly go from something to nothing. It is my very deepest belief that my mother no longer exists. She is not anywhere. I will not meet her on the other shore. She is not watching over me. She is not hanging out with her ancestors on Big Rock Candy Mountain. She is gone. But I do accept that the idea of her can be manifesting itself in new ways. I do not literally see her in the sunrise but I do feel the idea of her in the sunrise. I also accept Hanh's proposition regarding the perpetual nature of our genetic material. I carry her genes and she is manifested in me and in my biological children and my brother and his children. In this way there is a continuation of her existence. "Aware of the suffering created by fanaticism and intolerance, we are determined not to be idolatrous about or bound to any doctrine, theory, or ideology, even Buddhist ones. Buddhist teachings are guiding means to help us learn to look deeply and to develop our understanding and compassion. They are not doctrines to fight, kill, or die for." In a world of Prayer Warriors and jihadist armies this is delightfully refreshing. For once, I disagree with Hanh. Not an intense dogmatic disagreement, but a gentle difference in personal perspective. "Our greatest fear is that when we die we will become nothing," states Hanh in the first couple of pages in chapter 1, "We believe that we are born of from nothing and that when we die we become nothing. And so we are filled with fear of annihilation." I wholeheartedly reject the notion that death and the consequent non-existence are undesirable, albeit inevitable, occurrences. I For once, I disagree with Hanh. I wholeheartedly reject the notion that death and the consequent non-existence are undesirable, albeit inevitable, occurrences. I find Hanh's stance similar to other mainstream theistic attempts at diminishing the impact of death by presenting an "death is only a transition to another mode of existence" explanation. Attempting to ameliorate one's fear of death by explaining it away as a metamorphosis of one's existence from one form to another sounds - to me - no different from the Christian concept that death is followed by the transformation of a perishable body into an imperishable form that will inherit celestial glory. Personally, I found peace and "no fear" when I accepted the concept that my existence is a biological incident, a flash in the cosmic pan. My death is not an adverse event in my life, it is not the antipode of my being. My death will be the last event in a sequence the summation of which is my existence. "Far better, it seems to me, in our vulnerability, is to look Death in the eye and to be grateful every day for the brief but magnificent opportunity that life provides" (Carl Sagan, "Billions & Billions: Thoughts on Life and Death at the Brink of the Millennium"). "Có tám ý niệm nuôi dưỡng sự sợ hãi. Đó là ý niệm về sinh - diệt, đến - đi, khác nhau - giống nhau, có và không. Những ý niệm đó làm cho ta không hạnh phúc. Giáo pháp của Bụt dạy ta tám ý niệm đối nghịch gọi là tám không: không sinh - không diệt; không đến - không đi; không giống - không khác; không có cũng không không." tác giả giải thích rằng cái chết thật ra là một sự bắt đầu mới, dưới một sắc thái hay hình dạng khác. Vì chúng ta không được sinh ra cho nên chúng ta sẽ không bị hoại diệt (chết) "Có tám ý niệm nuôi dưỡng sự sợ hãi. Đó là ý niệm về sinh - diệt, đến - đi, khác nhau - giống nhau, có và không. Những ý niệm đó làm cho ta không hạnh phúc. Giáo pháp của Bụt dạy ta tám ý niệm đối nghịch gọi là tám không: không sinh - không diệt; không đến - không đi; không giống - không khác; không có cũng không không." tác giả giải thích rằng cái chết thật ra là một sự bắt đầu mới, dưới một sắc thái hay hình dạng khác. Vì chúng ta không được sinh ra cho nên chúng ta sẽ không bị hoại diệt (chết). Trước cái thời điểm gọi là "sinh ra" thi chúng ta đã ở một hình dạng khác, có thể là nước, là mây là đất, hay trong hình hài của tổ tiên chúng ta. Chỉ đợi đến khi có đủ điều kiện, chúng ta sẽ được biểu hiện ra. Giống như tờ giấy, trước khi là tờ giấy, nó là cây, là ánh nắng mặt trời, là đất, là nước, khi có đủ điều kiện, như là nhà máy và người công nhân, nó được biểu hiện thành tờ giấy. Khi bị đốt, nó lại hóa thành tro, rồi lại thấm vào đất, lúc này nó là đất, hoặc tan vào trong nước để trở thành nước, rồi nước lại hóa thành mây, mây kết hợp với gió và không khí, lại hóa thành nước, và lại được cây hấp thụ, lúc này nó là cây, và lại trở thành là giấy.. Có rất nhiều ví dụ, bên cạnh tờ giấy kia, về dòng sông, về con sóng, về nước, v.v. để giải thích cho sự không sinh-không diệt. Simple language, simple parables teaching very complex precepts and concepts about death and the dying. Simple enough for an open mind to understand but often dismissed by the casual reader because of their simplicity. I find Hanh's writing clear, concise, thoughtful, simple and profound. He is my teacher of choice and read him often. Admittedly I may have been guilty of reading more than I practice. I first read this book two weeks before my son was diagnosed with terminal cancer. I read it at Simple language, simple parables teaching very complex precepts and concepts about death and the dying. Simple enough for an open mind to understand but often dismissed by the casual reader because of their simplicity. I find Hanh's writing clear, concise, thoughtful, simple and profound. Admittedly I may have been guilty of reading more than I practice. I first read this book two weeks before my son was diagnosed with terminal cancer. I read it at the time for insight and It unexpectedly became a lifeline, those simple stories and parables came back to me when I needed them most. It allowed me to have the presence of mind to " water seeds of kindness " to provide comfort and ease my son's fear in his final hours instead of being uselessly consumed by my own suffering. I still suffered his loss then and I still do today. But I do have a greater understanding of death, of loss, suffering, fear and the importance of practice. "sehebat apa pun, seorang penulis yang mampu menggambarkan rasa buah durian buat kita tetap saja tidak bisa menyajikan sensasinya secara utuh karena rasa buah durian itu sendiri lebih dari sekedar konsep atau rangkaian kata kata"
salah satu buku yang wajib dibaca dan dipraktekkan agar kita bisa merasakan sensasi pengalaman itu secara pribadi..
Thích Nhât Hahn has once again written another powerful book. Many of the things can be found in his other works and yes he does repeat things over and over throughout the book. I found it helpful since it helped remembering without having to keep flipping back like other books. He helps explain death by discussing impermanence, existance, and the idea that we are not born so therefor we cannot die. A wonderful book though one that is not for everybody. I started reading this after Mom died trying to find a way to help cope with the grief. I read it slowly at first because it does talk a lot about death. But it goes beyond that and talks about impermanence, no self, and nirvana, basic Buddhist concepts. My favorite analogies were about the wave and the water, the candle, and the clouds. May I give this book 6 stars? I've read it several times and am comforted by it each time. It usually causes me to walk around the world saying to myself "I am that rock. I am that cloud. I am that man waiting for his bus." etc, and feeling great joy at the epiphany and hoping no one is watching me and the goofy expression on my face. Just thinking about Thich Nhat Hanh makes me smile. April 15, 2011: For the second time, I gave up on this book. A lot of people have told me how much they enjoyed this book, but I just could not get into it. The whole time, it seemed like he was doing little more than playing off ambiguities and vagueness, when his arguments could be torn apart by the tiniest bit of precision. Of course, I can't be sure; I didn't finish the book. This is definitely not Thich Nhat Hanh's best book. One of my main gripes about his writing is how repetitious he is, and that's a big problem in this book. I really do love the guy, so if you are new to his work and looking to read one of his books, I would recommend Being Peace or Peace is Every Step. “The day my mother died I wrote in my journal, "A serious misfortune of my life has arrived." I suffered for more than one year after the passing away of my mother. But one night, in the highlands of Vietnam, I was sleeping in the hut in my hermitage. I dreamed of my mother. I saw myself sitting with her, and we were having a wonderful talk. She looked young and beautiful, her hair flowing down. It was so pleasant to sit there and talk to her as if she had never died. When I woke up it was about two in the morning, and I felt very strongly that I had never lost my mother. The impression that my mother was still with me was very clear. I understood then that the idea of having lost my mother was just an idea. It was obvious in that moment that my mother is always alive in me.